Charles Dennington is a Sydney based artist who works with photography and sculptural installation. In his photographic practice he explores the expressive potential of distortion and adopts camouflage as a compositional strategy. His portraits mask their subjects and invert photography’s documentary imperative. They confuse the logic of straight representation and offset our ability to recognise form. While the sculptural components of Dennington’s installation work frequently possess anthropomorphic characteristics – with the found and fabricated objects used resembling faces or fragmented limbs – the figures in his photographs are often effaced. The pictorial distortion within Dennington’s photographs is produced through a combination of digital manipulation and direct physical intervention. Dennington works with deep shadow to obscure certain facial features before introducing more dramatic digital disfigurement in post production. In this photograph, the female subject’s face is barely perceptible. 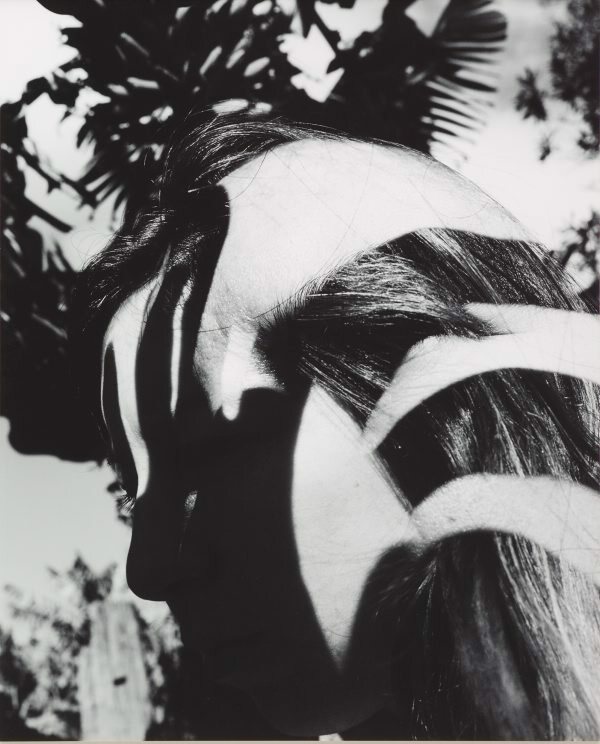 Fragments of skin are entwined in the woman’s hair while an impenetrable shadow masks her face. Severed from its source, the skin drapes across the figure like bands of light and serves as a perturbing counterpart to the forked leaves of the palm fronds in the background. This collaged skin disorients the scene, lending it a subtle yet viscerally surreal edge. The confluence of forms that are enmeshed and overlaid within the photograph maintain a tension between the expanding and contracting of space. The scene appears foreshortened and depthless – where the collaged composite creates the illusion a flat image surface – but also recedes and pulls the viewer into the background. Cultivating this tension, Dennington challenges the way we read and relate to photographic images. Here, the photographic document simultaneously reveals its subject and masks it. As Dennington asserted in 2015, ‘through photography a facade is expanded to be both simultaneously visible and visibly hidden.’ In his work Dennington examines and exploits photography’s capacity to contaminate the legible with the illegible.